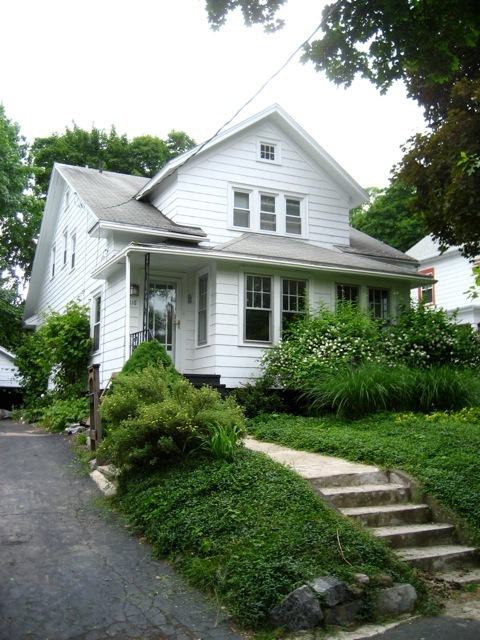 When we moved into our 1928 bungalow three years ago, it needed a new roof, a new paint job, shutters, and major landscaping. Little by little, we have gotten all of those items checked off of our to-do list. However, one eye-sore remains, and getting it done will be costly. Our front steps and mini-porch need to be replaced, and they are concrete. We want to have them torn out and replaced with something more fitting for our vintage craftsman style house. To tame down their evil look, I bought two gallons of concrete paint and put a temporary fix on it while Mom was here last week. Here’s a closer look at the grossness. 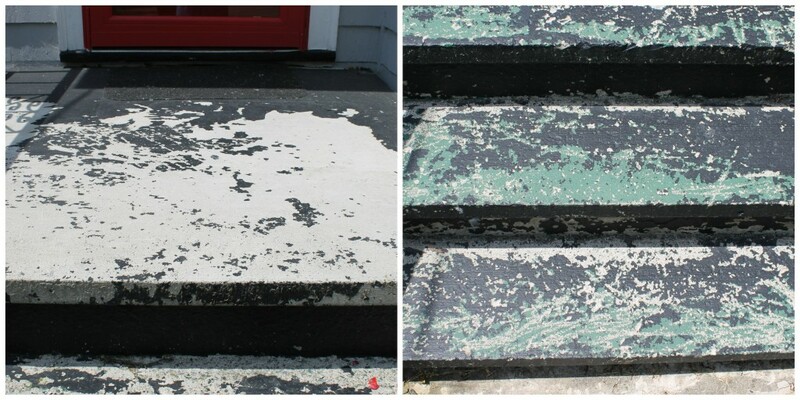 Before starting, I power washed them and then scraped away as much of the old paint as possible. I know they have been painted at least three times in the past – gray, green, and black. My plan was to make the steps look as if they have a runner on them. I have seen the same idea on some other blogs and knew the same look would be the perfect band-aid for our steps. 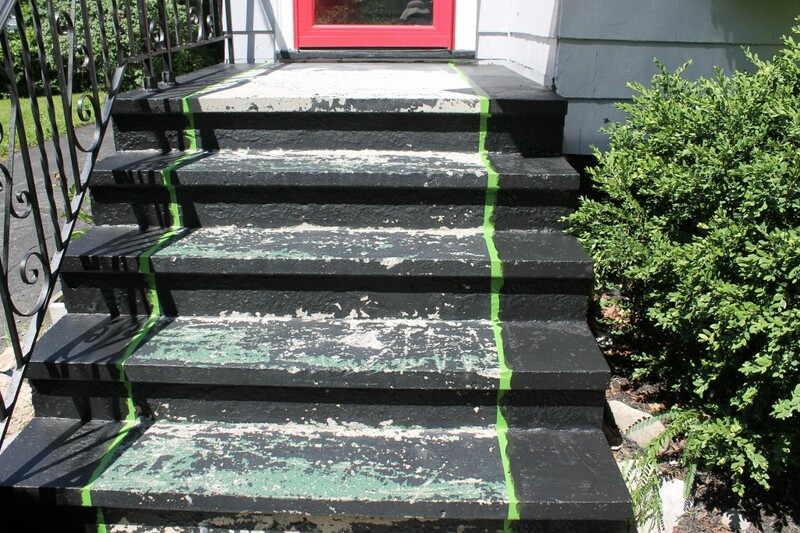 First, I taped them off and painted the outside of the steps using Behr black concrete paint from Home Depot. It dried quickly because I was working in probably the warmest part of the day. Then I taped off the outline for the runner, which I painted gray. This color took three coats. 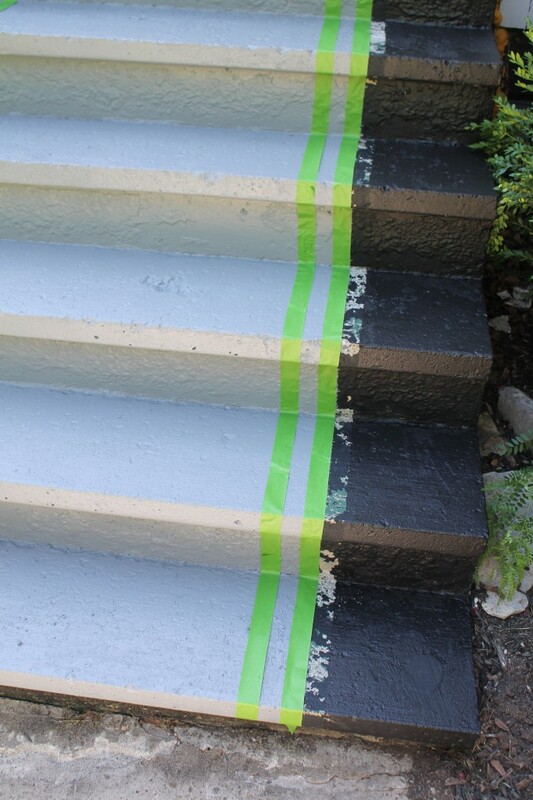 I lightly sprinkled sand on the final coat of paint so it would add some traction to the steps when they are wet. I was amazed by the improvement that came from a few hours of work. Here’s a side by side of the before and after. This is the way our house’s front looked when we bought it. Before I close, you might like to see a close-up of our window boxes. Even though Syracuse is very cold in the winter, the summer temps are perfect for growing the healthiest flowers. Thank you and I thrilled with the difference! 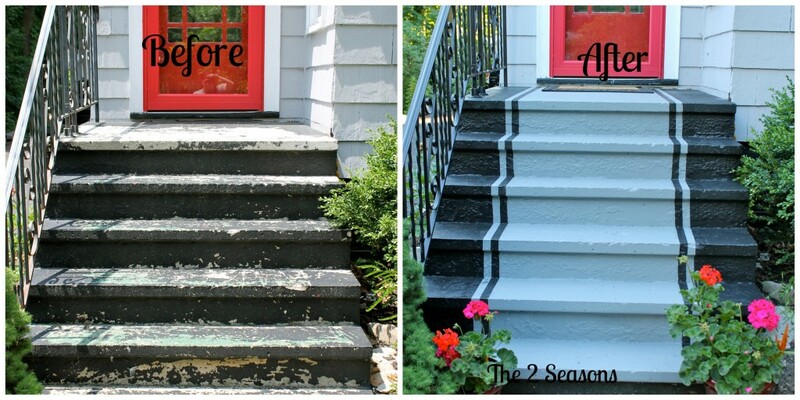 What a transformation… The house looks great overall and the makeover on the steps is a great touch. Thanks for the kind words. I agree it is a great touch! Wow! 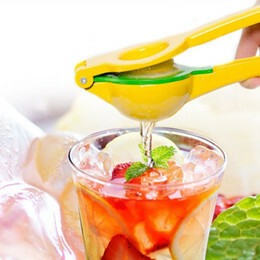 This looks so so fantastic! 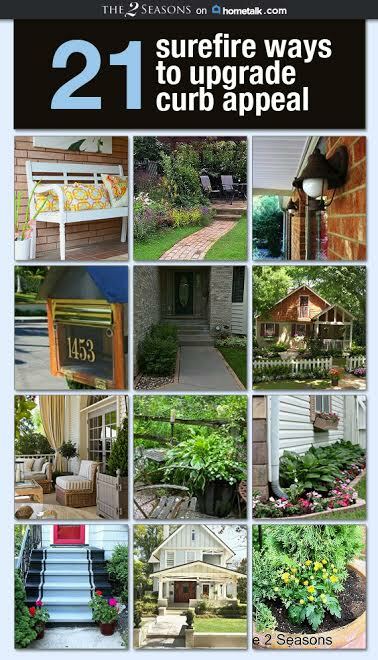 Your curb appeal is so darling! I love looking back and seeing the curb appeal process. Slowly making progress. Thanks Amanda! I wish I painted the stairs earlier. I am loving the look. I am still in shock every time I am outside and I see the difference. Why did I wait so long to do this easy project?? What a great idea for your steps, looks very nice. I enjoy your blog and love that you and your mom work on it together! We are glad to know you enjoy our little blog. We have fun working on it together. Look fantastic! I would love it if you joined and contribute your awesome posts at my link party at City of Creative Dreams, starts on Fridays 😀 Hope to see you there at City of Creative Dreams Link Party. Thanks for letting us know about your link party! 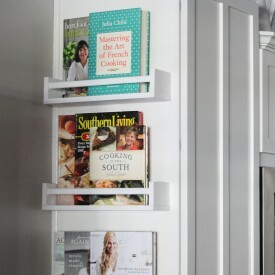 I would never have thought of doing that with the steps, I absolutely love it. Now I have to re-think mine because I think this would work. Also what color is the red on your door. Mine needs repainting in red that is a bit richer than what is on their now. Did you sand and primer it prior to painting. Wonderful home, you should be house proud. Thank you for the kind words about my house. I am loving the updated stairs! 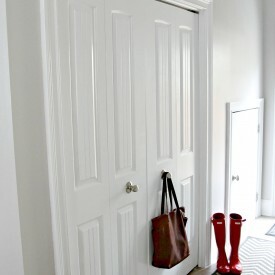 I cannot find the paint color I used for the door but I am pretty sure it was geranium by Behr. I do not think I sanded the door and now as I look back I should of sanded the door. I used the Behr paint with primer so I did not prime since the paint had the primer. Good luck and having a red door is so much fun. I love how you reduced the porch roof line. It truly updated the entrance. We were nervous at first to reduce the porch roof line and then we realized that was how the house originally was in terms of a roof line. I love seeing the before and after with the new roof. LOVE the make over–I want to do mine now 🙂 So glad to be meeting you via WOW us Wed. I’m east of you in Albany. Have a great week! Diana, we hope you continue to stop by. 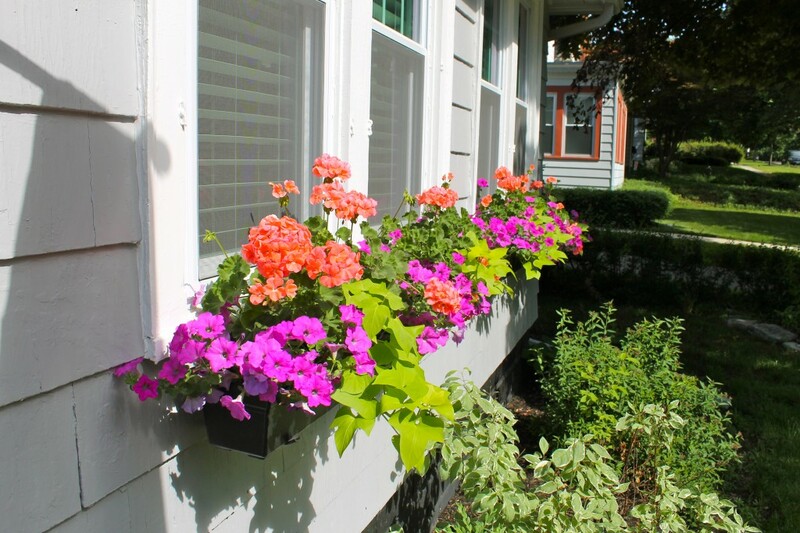 Great quick fix, enhances the curb appeal 100%—as do the window boxes, door color, & landscaping! Lovely job! What an excellent idea. Love the color of your house as well. 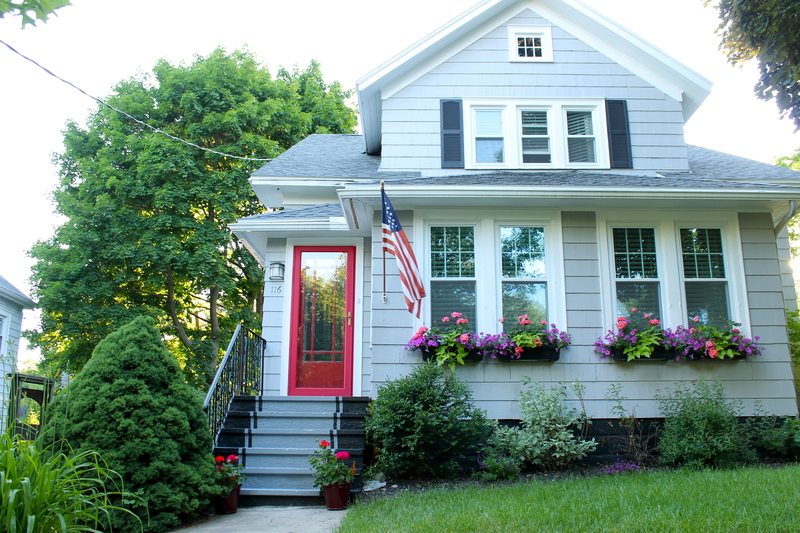 Would you mind sharing the paint colors and trim? I am new follower and absolutely love what you have done with your house. Thanks for the sweet words and welcome to The 2 Seasons. I used Behr paint with primer for the outside shingles the color is sparrow. The white trim is also Behr with primer and the color we used was snowfall by Behr. Please let me know if you have any other questions. You’ve done wonders with your house! : ) Your flower boxes look great! Wow what a great job! It looks amazing. 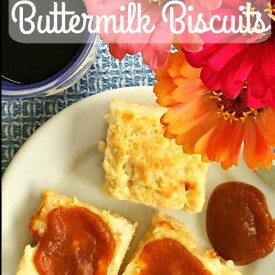 I am just thrilled and inspired to have found your blog and all of it’s charm and enthusiasm! 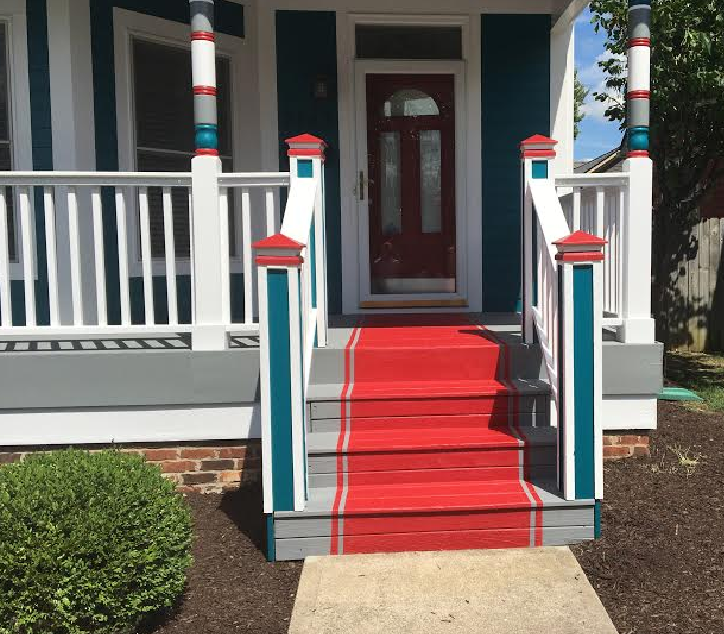 I love your new steps, too – what a difference your painting job did. It’s just perfect! Thank you Patti. We’re glad you found us, too. Please make us one of your daily reads. 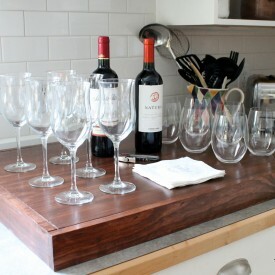 I was so thrilled with the final project for not that much work or money. Love the new mailbox and the steps. Love, love, love your front door. Is it original to the house? I just love all the panes and the color of the 2 doors together!! Yes the front door is original. We love the look and character of the door. Thanks for the sweet words about our house. Amazing what some paint can do. I love the transformation of your home. It looks so charming….like out of a storybook. 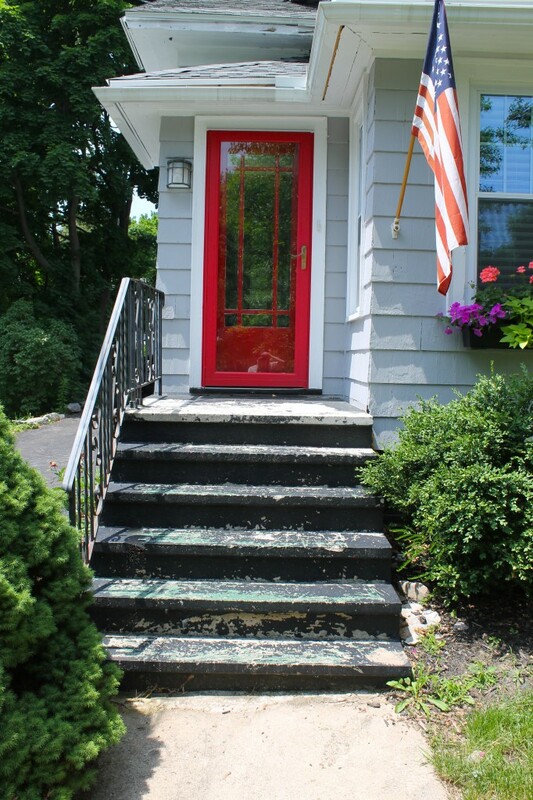 I am painting my front door red next week. I love how it looks! Those just shows us a bit of loving care, paint and flowers can make any place shine and add beauty to your home adn your street!! Amazing! The whole house is gorgeous – hard to believe it’s the same place. Absolutely love it! What a great look…gorgeous! Great choice of color and design. Very clean and crisp looking. Really increases your curb appeal without overshadowing the house. Great job on the stairs. 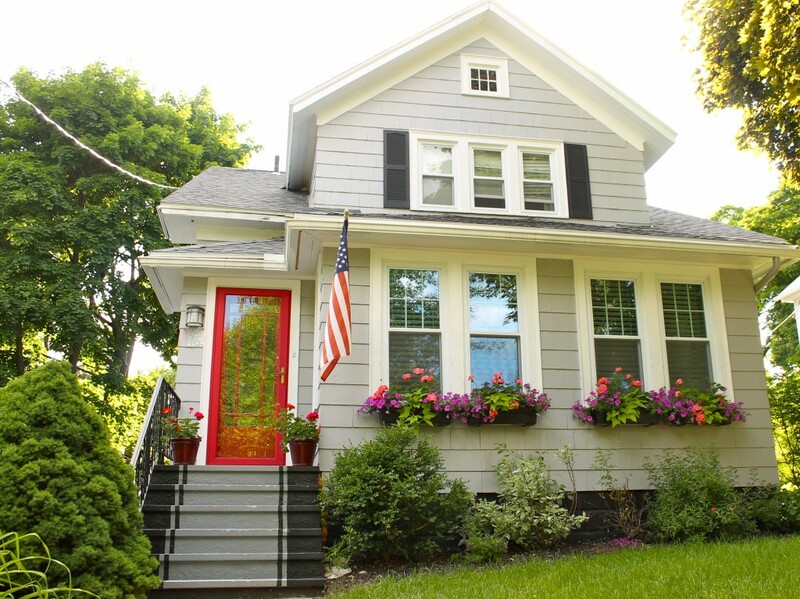 Your house has beautiful curb appeal!